Arsene Wenger will be pondering this decision right up until he has to hand in his side's team sheet to Howard Webb at 7pm. Does he start Cesc Fabregas against Manchester United? It's a difficult decision. His captain has been training hard to be ready to face our old enemy and no doubt wants to be involved. But does the Frenchman pick a player who has not played competitive football since coming off injured in the Champions League against Braga 20 days ago. The statistics don't lie. Fabregas has played in five of our away league games this season. Being on the winning side four times. The other occasion - a point was gained at Sunderland where the captain came off the pitch injured. It all points to his inclusion in the starting line up but I would suggest the bigger picture is more important. If Fabregas is not 100% he should not be risked. We have important fixtures ahead against Stoke this weekend followed by Chelsea eight days later. Then just 48 hours after playing the blue half of south west London, we face a trip to the JJB to take on Wigan. The fixtures continue to come fast and furious, with a visit to the west Midlands to take on Birmingham in the second city, then days later we take on Manchester City at the Grove. By no means is this an easy period in our fixture calendar. Tomas Rosicky showed at Aston Villa he is able to fill the role occupied by our captain. He stepped up as he has done whenever he has come in to the team this season and was one of the reasons we won at Villa Park in my opinion. 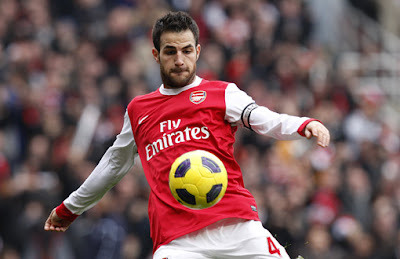 As he does not hog the central area like Fabregas does, it allows our attack to become more fluid. Nasri and Arshavin can interchange with the Czech which causes defences all sorts of problems. His industry in the midfield as well as his driving runs at the opposition make him a key player in our attacking armory. He also isn't afraid to put in a tackle nor track back and help his defence. The other question mark in our starting line up hangs over the inclusion of Lukasz Fabianski. All the indications are pointing to Fabianski not being fit enough to start the game tonight. If this is the case, his young compatriot Wojciech Szczesny will step into his place. I have no qualms with this. Szczesny has proved in his stint in the Carling Cup team this season he's not afraid to step in between the sticks at this level. I don't believe this won't be the cast at Old Trafford tonight, if indeed he is called upon. I'll post the starting line up as soon as it is announced. Come on you Gooners!! !